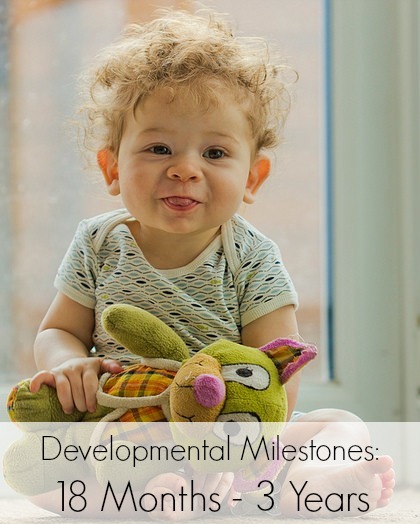 Ever wonder what the major development milestones for toddlers and infants are? While every baby and toddler learns at a different rate, there are some things that most children should know by a certain age. These markers are known as milestones, and it is just one of many ways to make sure you child is developing on step with other children the same age. As someone who works within the special needs community, I hear from other parents who are worried their child isn’t developing normally when in fact it’s perfectly fine and age appropriate. On the other hand, I’m always surprised when I child is obviously behind but the parent doesn’t see it (or doesn’t want to see it). The following information provides a few guidelines for the major developmental milestones for toddlers from 18 months to 3 years. Use these as markers, but if you find your child isn’t hitting the developmental stages, connect with your pediatrician to figure out if something does need to be addressed. 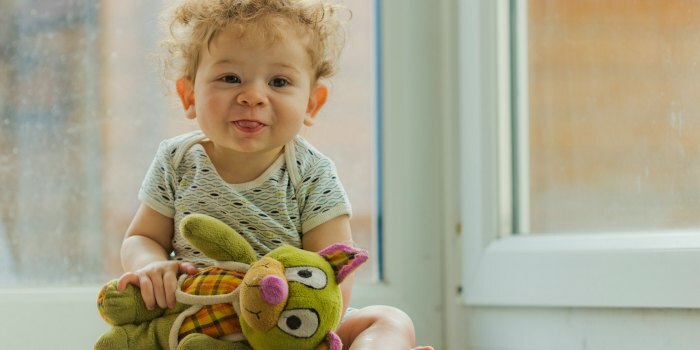 By 18 months, babies should be able to express his or her needs and desires by indicating no and yes and also pointing to things they want or places they want to go. Since they are nearing the terrible twos, they may become more stubborn at times, shaking their head insistently and sometimes even throwing little tantrums. Luckily by now, 18 month olds understand simple directions and most everyday objects. You should be able to ask them to pick up common things like a doll or a telephone. These little toddlers should no longer be drinking from bottles and should be on to sippy cups and eating with assistance. Two year olds should have moved on from sippy cups to regular cups; this means that they can still use the sippy cups but should have the skill to drink out of a regular cup. I know my boys still love their sippy cups! It’s an oral seeker thing with them. By this time, you can name off body parts and your 2 year old should be able to point to it on his or her body. At this point toddlers should also recognize family members and be able to identify them by pointing or in pictures too. We actually put up a collage of family photos so my boys could get to know their extended aunts, uncles and cousins. During play time, these toddlers will start to sort and separate objects and they will also start to stack things. They can communicate with simple sentences and also follow simple instructions. At 3 years old, your little one has grown up quite a bit, now being able to dress and undress themselves with little or no help. They also like to play with other children and can handle being separated from their parents a little easier. By now they should be able to speak well enough for other adults to understand and answer simple questions like their name and age. Toddlers at age 3 should know how to open most things like jars, lids, doors and boxes. While children all develop at their own pace, it’s important for children to hit these age-appropriate milestones as well. My youngest son wasn’t talking by the time he was three. We knew it was an important milestone and began to get him the help he needed. Now he’s a fabulous chatterbox, but that’s because we took the steps to start helping him when we realized he wasn’t progressing as he should. Caught early, you have a better chance in helping out your kiddo. It’s good to hear that your child starting talking after 3. I’ve heard a few moms panic when their child doesn’t talk much before age 3. They think it’s a sign of autism, but you’ve shown that that’s not always the case. We’ve got to stop comparing our kids to others. Actually, your child should be talking around age 2. But if they reach age 3 and are not very verbal, it’s time to get an assessment. It was a red flag for us and we got him the help he needed. It’s great to have a guideline, so any potential problems can be caught early! Hello, my grandson is 2.5 years and has difficulty with pronounciation.He speaks 3 word sentences but I dont undestand the words he says.Do you recommend speech therapy at this early age? If you live with your grandchild full time and cannot understand what he is saying, then yes, it’s an indication that he should be evaluated by your school district. I was surprised that you are in the field of early childhood, but recommend use of sippy cups past 18 mos. The enclosed reference sites some good reasons why parents should be quicker to avoid or quickly transition children to open cups. While I would agree that parents should move forward from sippy cups in general, when you are managing a child with special needs and specifically oral sensory needs, you need to look at the bigger picture and what the child needs to cope with the sensory world around them. Blindly following guidelines because they are there rather than taking into account the specific sensory diet needs of a child doesn’t help the child, in my opinion.